As promised this month we’ll take a look at Floor Plan Manger for Web Dynpro , The “Business Rule Framework Plus” and SAP Stream work. – The design of all cross-application components of a user interface is defined by the Floorplan Manager. – The design follows the SAP user interface design guidelines. – Users of such applications benefit from a high level of recognition, which enables them to quickly and easily familiarize themselves with new applications. – The integration of design templates such as floorplans and generic user interface building blocks into Floorplan Manager accelerates the creation of user interfaces and also ensures that the user interfaces behave the same way in all applications. – Time-consuming user interface programming is greatly reduced for application programming. – Simple applications are adjusted by configuring the underlying Web Dynpro components and not by additional programming. – Adjustments that you make to the user interfaces of applications using the Floorplan Manager configuration editor are modification-free changes. – Floorplan Manager uses the Web Dynpro adjustment concept. So what’s new in ABAP AS 7.03 to enhance both the end user and developer productivity? 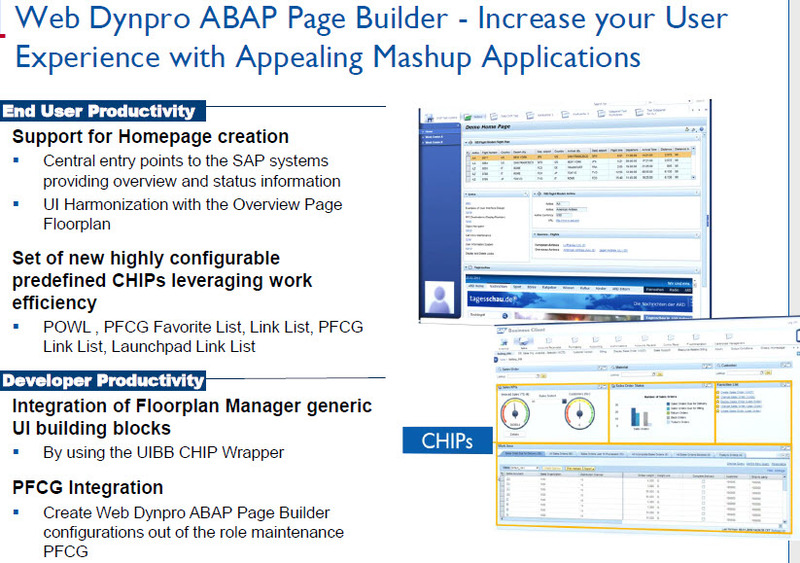 The Web Dynpro ABAP Page Builder, is a new runtime authoring tool, used to easily build Web Dynpro pages using CHIPs (Collaborative Human Interface Parts). Typically, you use the Page Builder to design home pages that enable users to access their main tasks and that provide the option to adapt the page, for instance by adding CHIPs to it in which their favorite Web pages are embedded. Lest look at an example below…. Again, lets get some background first…..
SAP StreamWork is a collaborative decision-making environment hosted on the web. This product lets people make decisions by discussing an issue online, sharing information, and taking advantage of a set of business tools. With SAP StreamWork, you can provide trusted information, coordinate people, and monitor discussions to make better decisions based on facts. In SAP StreamWork, you use notes, documents, email, and a set of professional decision making tools to help you and participants make business decisions. Below are some KEY scenarios StreamWork can be used .. If you enjoyed this blog, What’s New in ABAP 7.02 and 7.03 – Part 3, please fill out the form below to sign up for our newsletter. We deliver SAP Technical tips & tricks, SAP news, and the current month’s BLOG right to your inbox!